Specifically, Manufacturers need to build solid strategies for their brands, create unique Shopper experiences, develop successful innovation and compelling assortments, planogram efficiently and effectively, and appropriately price and promote their products. But many (or maybe most) don’t realize that these goals are all part of the category management approach and that CatMan is the pathway to becoming more efficient and effective. Practicing CatMan presents a huge opportunity for Manufacturers in industries and geographies in the world that don’t officially practice category management AND for Manufacturers who tend to brush off the importance and value of category management when they see Retailers not utilizing. But beware of change ahead. As industries change and evolve, the performance gap between the CatMan and Non-CatMan practicing organizations will widen. Joint Business Planning with Retailers. Thinking about category management yet? Check out these 5 Category Management Approaches for Manufacturers or grab the ebook above for even more insight. Become Retailer-Centric: By considering the goals of your unique Retail Customers and their Shoppers, you will position yourself to create better solutions for both. Category definitions, roles & strategies, and even the category management process will help you to better understand retail. Even if your Retailers don’t practice CatMan, understanding retail concepts and processes will help you ask better, more strategic questions to create more productive discussions. Become Category Focused: By considering category, subcategory and brand perspectives, you will identify more and bigger opportunities for your business. Retailers can’t possibly analyze their entire business without Manufacturer partners, and those Manufacturers that offer the most compelling Shopper insights and fact-based business opportunities are more likely to win. Increase success of your new product launches. Improve Planogram Outputs: The goal of planograms should not be pretty pictures, yet so many organizations continue to develop shelf sets without any data inputs or strategic considerations. Planograms can be an incredible resource drain and should not be treated as a tactical necessity for your organization. Sometimes less is more, and by slowing down the planogram factory line and incorporating strategic considerations (like retail strategies and Shopper insights) and data (like unit sales and costs) into your planograms, you will become an expert on understanding the shelf, and add much more value to the conversations you have with Retailers. Bring Value to Retailers through Better Business and Category Reviews: Whether you are creating an internal or external review, you should start with a big picture perspective (vs starting it at a Retailer or brand perspective). By analyzing the business with a broadened perspective (like “category” or “market”), you see many more business opportunities, which add value to your own internal understanding of the business, as well as to your Retail customer’s business. Adding value to your Retail customers builds collaborative discussions that go beyond negotiating the best price for your products. In net, category management offers an incredible opportunity for Manufacturers who are looking for more strategic ways to improve return on investment in data and technology, increase and develop fact-based decision making and presentations, advance Shopper understanding, and ultimately, enhance business results. So why practice CatMan as a Manufacturer? Integrate Shopper Insights into all analysis work — remember, it is the Retailer’s Shopper. 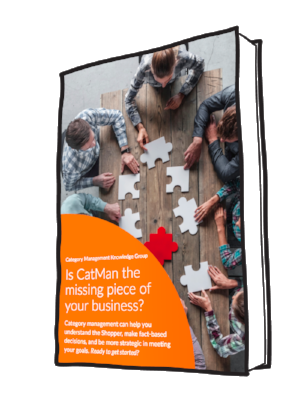 Get our ebook, “Is CatMan the missing piece of your business?”. Learn how category management can help you be more strategic in meeting your goals.